HemmingGirl: Coachella Fashion 2015 -How to do it right! Coachella Fashion 2015 -How to do it right! So, if you're anybody in the music industry you will have headed down to the Colorado Desert sporting your best festival clobber, not only to perform but to show the world you know how to dress to impress in the desert! There have been some big attending the event such as Beyonce, Rihanna, and Drake -I'm sure we have all heard about that performance! We have scoured the internet and found our top celebrity fashionistas attending the festival this year. Of course we had to throw in a few of them who, well... didn't impress us so much. Obviously all of our fashion opinions are debatable and you can voice your own opinion on the matter in the comments below! One person who is really rocking the bohemian look this year is none other than the fashion icon Kendall Jenner, we are absolutely loving her gypsy/indian style! This gorgeous off the shoulder gypsy style crop is really complimented by the flowing maxi skirt she has paired with it, the added glam of the gold accessories really add this festival chic look. We are loving the angelic look of her gold headband too. Where theres a Kendall, theres a Kylie, and how gorgeous does she look! We love the understated look of her neutral tones this year. She probably thought the bright teal hair was enough of a statement for one day! We love her grey cap and matching boots too! Next on our list of festival fashionistas will have to be the one and only, Beyonce. Although she was only attending the bash Beyonce dressed to impress with this stunning Saint Lorent floral dress! It is just stunning, it is breezy and shows off all those curves. The colours compliment her skin tone perfectly, Love it! Next on our list of top fashionistas this year is going to have to be Alessandra Ambrosio. Her washed out tie-dye effect dress is to die for. We absolutely love everything about this look and it also helps a bunch when all of your model friends have decided to match with you to create the perfect festival photographs! Another little lady that caught our attention this year was the beautiful Vanessa Hudgens, with this bright indian style play suit we are positive she turned some heads! We fear she may have over done it with all the accessories she is sporting but who cares with style like that! So now we have seen our do-gooders of Coachella 2015, we thought we would throw in a couple of shall we say, not so impressive looks. It pains us to say it but the first person on our list is going to have to be the gorgeous Katy Perry. 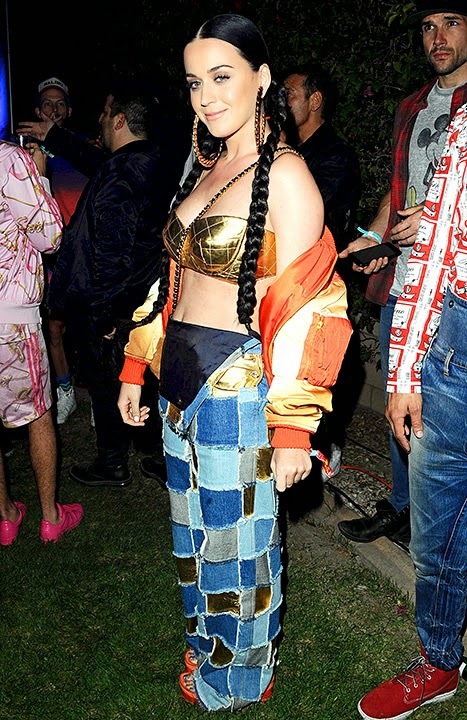 We are not exactly sure what this mismatched look is all about, maybe there was some fashion method to the madness but we are really struggling to see it unfortunately, better luck next time Katy! Next on our list of dont-do's is Rihanna. We hate to say it but, this coat might just be the worst coat we have ever seen. It helps slightly that she has managed to find the perfect match in lipstick, but its just not quite cutting it we're afraid! We aren't too sure whether we like those boots either. So, what do you think folks? Who were your favourites this year, we would love to know so drop us a message in the comments and we will be sure to reply!